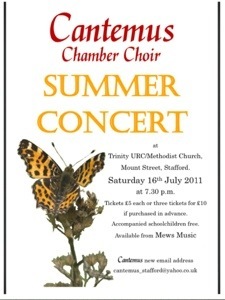 Here you will find a selection of our past concert details, posters and old program’s from the last few years. Our Christmas Concert took a different format this year. We decided to treat our listeners to Christmas Past and Present. 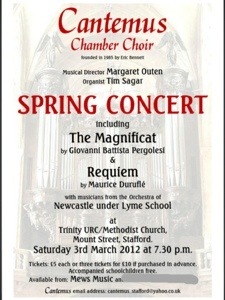 All of the music and readings in the concert was written by British composers. We also invited a recorder ensemble from Stafford Grammar School. 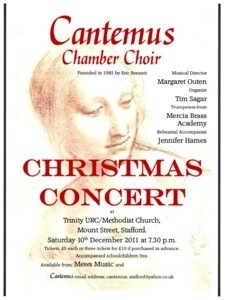 Cantemus performed a mixture of sacred pieces and secular madrigals and part songs. 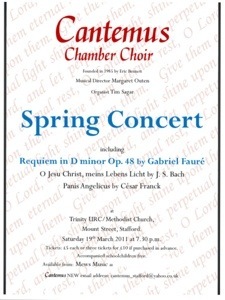 The concert will include Mozart’s Laudate Dominum, Schubert Ave Maria, Faure’s Cantique de Jean-Racine, Elgar’s Spanish Serenade, Finzi’s My Spirit Sang All Day, Viadana’s Exsultate Justi, and Rutter’s Feel the Spirit. We held a Come and Sing Day in September 2012. The day ended in a performance of Spem in Alium by Thomas Talis. 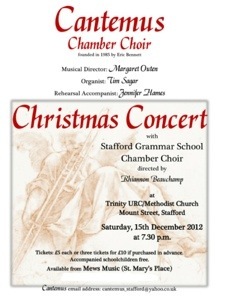 Once again we took part in the Stafford Music Festival. We performed pieces by Monteverdi, Viadana, Purcell, Palestrina, Tallis and Gabrieli at St Chads Church.